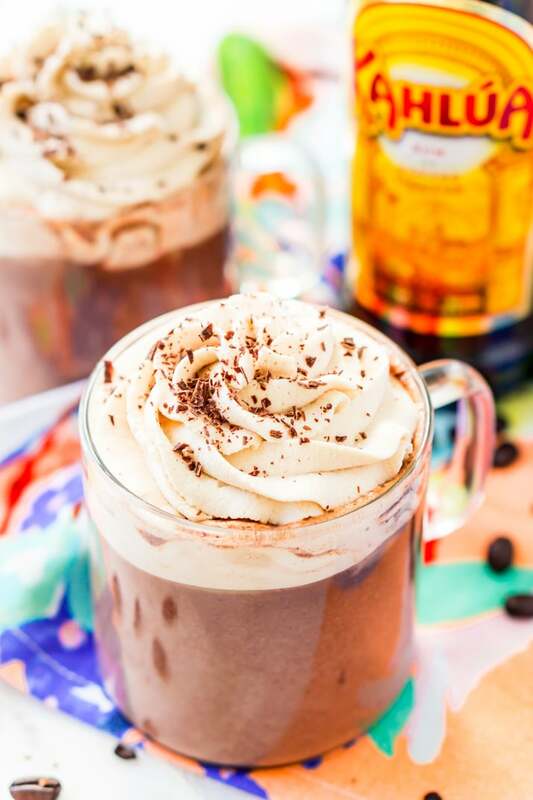 This Kahlua Hot Chocolate is so rich, creamy, and BOOZY! 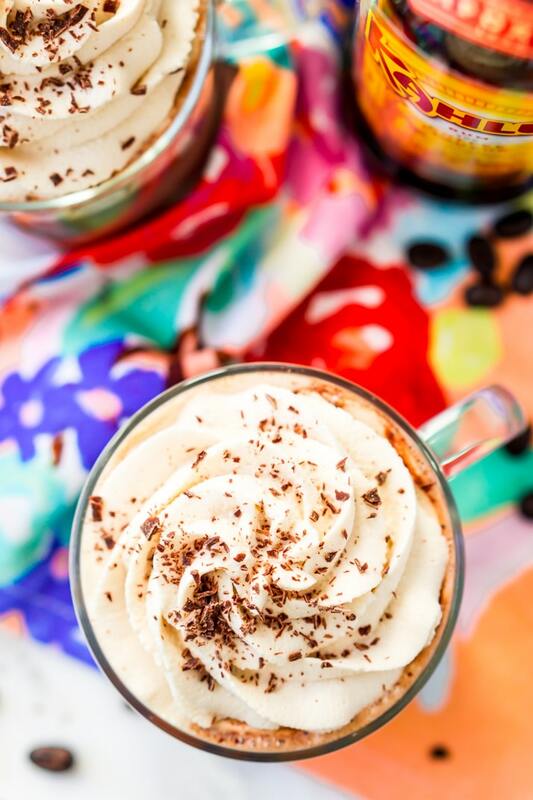 This hot chocolate recipe is laced with coffee liqueur and topped with a Kahlua Whipped Cream and chocolate shavings. I don’t know about you, but here in Maine, this winter has been very cold… and very snowy! After trudging inside from shoveling the driveway, especially after a long day of work, it’s often a toss-up as to which I need more: a hot drink, or a spiked drink! Instead of choosing, I combine the two in this decadent recipe for Kahlua Hot Chocolate. One of my favorite additions to hot chocolate is Kahlua, and I couldn’t wait to make a cup of it this past weekend when the -30 weather rolled in. Yeah, this Maine weather has been really cute, lately, really cute, I tell ya! This indulgent drink is like comfort in a cup and will warm you from the inside out, even on those days when you’re chilled to the bone. It’s made with a blend of creamy whole milk, rich bittersweet chocolate, a touch of powdered sugar, and of course the signature ingredient: Kahlua! Each steaming mugful is made extra indulgent when topped with fluffy Homemade Marshmallows and a generous swirl of spiked Kahlua Whipped Cream. What I love about this Hot Chocolate is that it warms you up, but the Kahlua keeps you warm. It’s such a great flavor addition as well, I mean, who doesn’t love a little rum and the coffee notes add such depth! This hot chocolate is creamy and frothy and well, downright amazing! I love wrapping my hands around a mug of Kahlua Hot Chocolate when I’m curled up with a blanket, a book, and my snuggly pup. This boozy beverage always takes the chill off and will keep you feeling toasty, even when the temperatures dip below freezing. It’s the perfect treat to enjoy when you’re snowed in, or on a frigid evening when you want to unwind by the crackling fire. 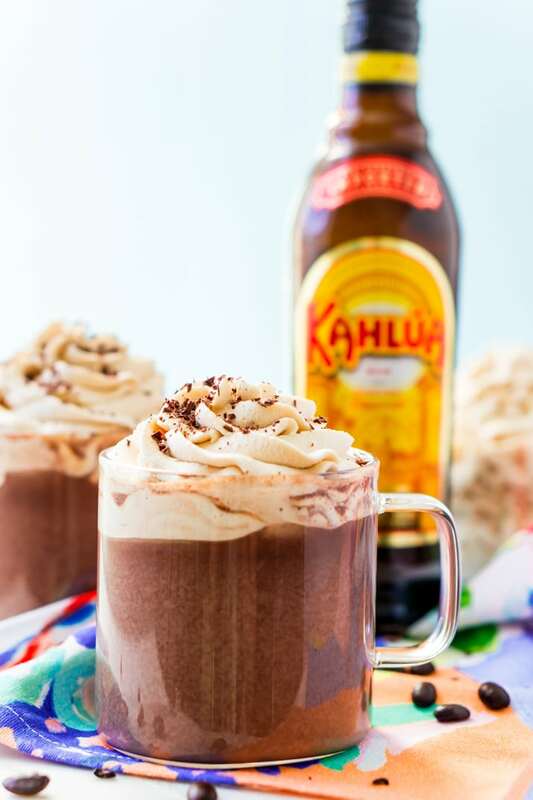 This Kahlua Hot Chocolate is the kind you drink to relax. I’ve made this with traditional, French Vanilla, and Hazelnut Kahlua, all of which were very good! It’s definitely an adult hot chocolate, so don’t go sharing with the kids. Plus, you deserve to have something to yourself for once, don’t you? Look at that melting frothy whipped cream, you know you want some! 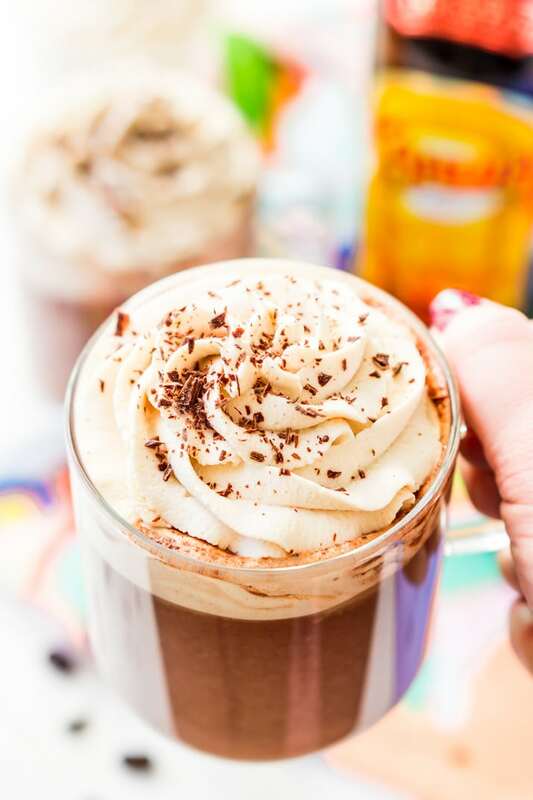 Since Kahlua Hot Chocolate is one of my favorite treats to sip in the wintertime, it’s only natural that I’d want to share the warmth with loved ones! Whenever friends or family come to visit, I like to mix up a batch of these chocolatey cocktails to enjoy while we mingle or as an after dinner dessert drink. It’s even more fun to serve when guests can choose their own toppings and accompaniments, and I like to set out bowls of marshmallows, chocolate stirrers, sprinkles, biscotti, whipped cream… and anything else you can dream up! Of course, young guests can have their cocoa without the Kahlua; this recipe is still tasty without alcohol. Kahlua Hot Chocolate is the decadent treat that’ll get you through winter. No matter how low the temperature dips, a steaming mug of this boozy beverage will warm you and your loved ones from the inside out. Serve it up in a cute mug! Combine milk, Kahlua, and sugar in a medium saucepan and bring to a light simmer over medium heat. There should be bubbles around the edge of the pot before removing from heat. Meanwhile, melt the chocolate in the microwave on 30-second intervals, stirring between each one, just until melted. 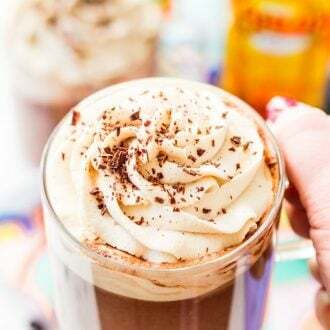 Whisk the melted chocolate into the milk mixture in the saucepan off the heat, pour into 2 mugs and top with Kahlua whipped cream and chocolate curls or a dusting of cocoa. This post was originally published on January 7, 2014, and was updated on January 21, 2018. 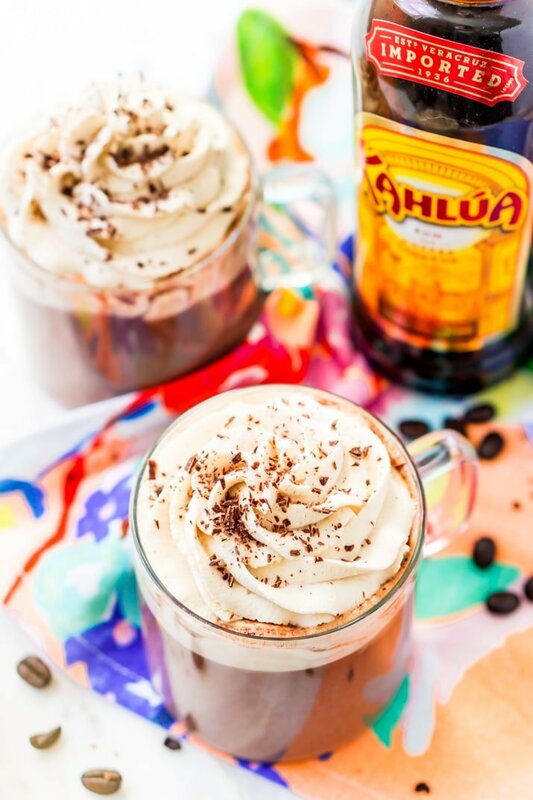 Pin this Kahlua Hot Chocolate for Later! I am sipping on this hot chocolate right now! Love adding Kahlua to sweet drinks!